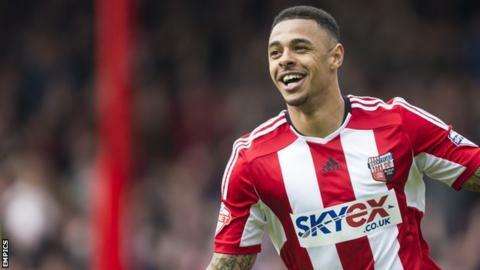 Striker Andre Gray played a starring role as Brentford beat 10-man Bristol City at Ashton Gate. The hosts took an early lead through Jonathan Kodjia on his home debut before Alan Judge got the equaliser. City were back in front from Aaron Wilbraham's header but Luke Freeman was sent off for a reckless high tackle. Derrick Williams put the ball into his own net for 2-2 before Gray slotted home, and Philipp Hofmann sealed all three points from inside the area. Playing their first home game since returning to the Championship and at a newly refurbished Ashton Gate, City got off to the perfect start when £2.1m summer signing Kodjia slotted home from 10 yards after being played in by Luke Ayling. Gray, who has been strongly linked with a move to Hull City, had not been expected to start but was a menace throughout and, after goalkeeper Ben Hamer made a mess of his shot, Judge was on hand to convert. The Robins made it 2-1 when Wilbraham flicked Marlon Pack's corner past David Button, but after Freeman was sent off for a poor challenge on Harlee Dean the momentum shifted Brentford's way. Williams, under pressure from Gray, put the ball past his own keeper from a whipped cross and the Brentford forward powerfully side-footed home from 10 yards on the hour. Hofmann later sealed Brentford's first Championship victory of the season, with the result compounding City's poor start which leaves them without a win from three games, having also been dumped out of the League Cup in midweek. "The red card changed the game. Luke is not looking at the player, he can't see the lad, I'm not sure it's a red card. "I'm disappointed the Brentford players surrounded the referee and I'm not sure why he needed to speak to his linesman when he was further away. The linesman didn't think it was a red card. "If he is looking at the player it's an unbelievable red card - but he is not looking at him. There is no attempt to harm the player. There is no point speaking to the referee, it's a waste of time. When we're down to 10 men it becomes a long week for us. With 11 men we were the better team and could have been five up. "Dwight Gayle won't be coming here, he has made it clear he does not want to come so we have to move on. We have other targets, it's just whether we can afford them or not. I don't know if that money is going to be available or not." "For the first 35 minutes they were the better side and the red card changed it. It was very dangerous. "Andre was very good for us, a rising star, I'm very happy with him. Last week it looked like he was going to another club so that's why he said he didn't want to play. "The clubs have not agreed with him so he is still our player. He was great, the price will be higher after today. He is quick, strong and can score goals. Of course we want to keep him. "I don't know if he will stay, I'm not in charge of that, there is a lot of money in England and sometimes money talks." Match ends, Bristol City 2, Brentford 4. Second Half ends, Bristol City 2, Brentford 4. Attempt blocked. Andre Gray (Brentford) left footed shot from the left side of the box is blocked. Assisted by Alan Judge. Foul by Lasse Vibe (Brentford). Attempt missed. Callum Robinson (Bristol City) right footed shot from outside the box is close, but misses to the left. Assisted by Korey Smith. Callum Robinson (Bristol City) wins a free kick in the defensive half. Attempt saved. Marlon Pack (Bristol City) right footed shot from outside the box is saved in the bottom left corner. Assisted by Kieran Agard. Attempt blocked. Kieran Agard (Bristol City) left footed shot from the left side of the box is blocked. Assisted by Callum Robinson. Attempt blocked. Callum Robinson (Bristol City) left footed shot from outside the box is blocked. Assisted by Wes Burns. Substitution, Bristol City. Wes Burns replaces Aaron Wilbraham. Andre Gray (Brentford) wins a free kick in the attacking half. Goal! Bristol City 2, Brentford 4. Philipp Hofmann (Brentford) left footed shot from the centre of the box to the bottom right corner. Assisted by Andre Gray. Philipp Hofmann (Brentford) wins a free kick in the attacking half. Substitution, Bristol City. Kieran Agard replaces Jonathan Kodjia. Substitution, Bristol City. Callum Robinson replaces Ryan Fredericks. Alan McCormack (Brentford) wins a free kick in the defensive half. Foul by Toumani Diagouraga (Brentford). Substitution, Brentford. Lasse Vibe replaces Konstantin Kerschbaumer. Goal! Bristol City 2, Brentford 3. Andre Gray (Brentford) right footed shot from the centre of the box to the bottom right corner. Assisted by Alan McCormack. Attempt missed. Jonathan Kodjia (Bristol City) left footed shot from outside the box misses to the right. Assisted by Ryan Fredericks. Foul by Akaki Gogia (Brentford). Marlon Pack (Bristol City) wins a free kick in the defensive half. Attempt missed. Jonathan Kodjia (Bristol City) right footed shot from the centre of the box is just a bit too high. Assisted by Derrick Williams. Attempt missed. Alan McCormack (Brentford) right footed shot from the right side of the box is too high. Assisted by Alan Judge. Foul by Konstantin Kerschbaumer (Brentford). Korey Smith (Bristol City) wins a free kick in the attacking half. Attempt missed. Andre Gray (Brentford) left footed shot from a difficult angle on the left is too high. Assisted by Konstantin Kerschbaumer. Akaki Gogia (Brentford) wins a free kick on the right wing. Hand ball by Jonathan Kodjia (Bristol City). Attempt missed. Jonathan Kodjia (Bristol City) right footed shot from a difficult angle and long range on the right is close, but misses to the right. Assisted by Ryan Fredericks. Attempt blocked. Alan Judge (Brentford) right footed shot from the left side of the box is blocked. Assisted by Akaki Gogia.